vacancies of Assistant Executive Engineer AEE Civil Jobs through written exam. There are total 277 vacancies in this TSPSC AEE Civil Engineer Jobs Recruitment 2017. 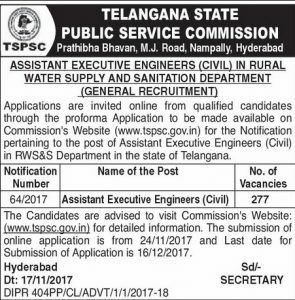 Currently this TSPSC AEE Assistant Executive Engineer vacancies are going to fill in the departments of Telangana RSW&S. Selection for this TSPSC Assistant Executive Engineer Jobs will be held based on written exam and interview only. For complete details regarding Telangana PSC Assistant Executive Engineer AEE Jobs Recruitment 2017 complete details are given below. There are total 277 vacancies available in Telangana Rural Water Supply & Sanitation Department. Minimum age is 18 years and maximum age for General candidates is 44 years as on 01-07-2017. For SC/ST/BC candidates of Telangana State age limit is 18-49 years. Candidate must have qualified B.E/B.Tech in Civil Engineering from any recognized university. Application fee is Rs.200 and Exam Fee is Rs.120/- for SC/ST, BC & PH candidates no Exam Fee. Selection for this AEE Jobs will be based Written Exam and Interview. Written Exam will be conducted for 450 marks. Candidates have to attend the two papers. For Each paper 150 questions will be given and each paper exam duration 150 minutes. Online applications only accepted for this TSPSC Recruitment of Asst Executive Engineer vacancies of CAD, R&B and other departments. Last date for submission of application form online is 16-12-2017. Post Name and vacancy details of TSPSC are given below.